Happy Wednesday! This is Kim, with Fantastical Menagerie. 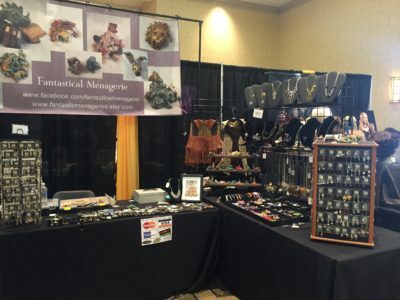 This coming weekend, you can find my things at a local show in North Carolina, Hickory ComicCon. It’s June3rd, in Hickory, NC. I and a number of other artists and vendors will be set up at this event at the Hickory Metro and Convention Center from 10-5. You can find the event information here. They offer a costume contest, comic book grading, and the 501st Legion will be there are well. This show offers an opportunity to stick your toes in and try out a smaller event, and see if you like them. 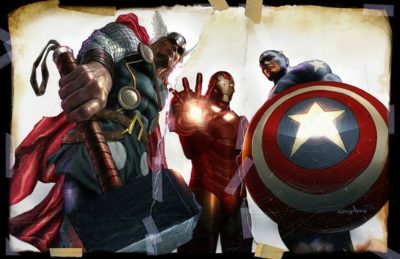 North Carolina offers a number of one day events like this each year, including Shelby ComicCon, Statesville, Greenville, and one in Marion, NC. They offer a relaxed environment, the opportunity to network with other local geeks, and gaming! I will have my small setup here, but some really cool new designs and pieces. *Photo taken from Hickory ComicCon’s event page. 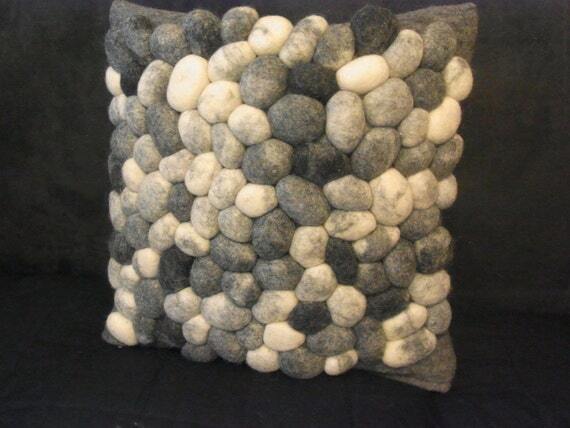 Crafted and sold by Etsy shop flussdesign, these rock rugs start at around $160, but the one pictured above costs $940. They come in all sorts of colors options too. 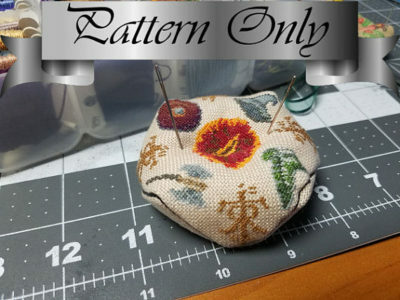 So, yeah, if you’re low on cash now might be a good time to learn how to make felt stones, lol. I’ve never hand felted before, but I do know it’s very time consuming work so you’d better be prepared for that. Scrolling flowers, vines, and bees seem to be very popular choices. 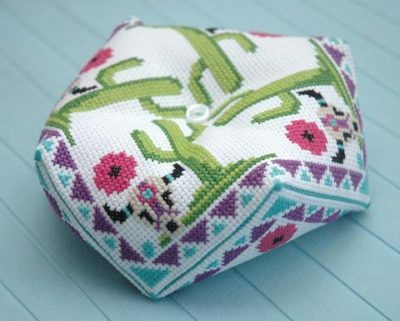 Complete with lovely southwest style pattern! Appropriately titled, “We’re All Mad Here” and I am definitely mad for it! And you can stab the Eye of Sauron every time you stitch! I have so many ideas for amazing biscornu designs! I’ll make sure to share when I put some into action. Until then, have a relaxing rest of your weekend. 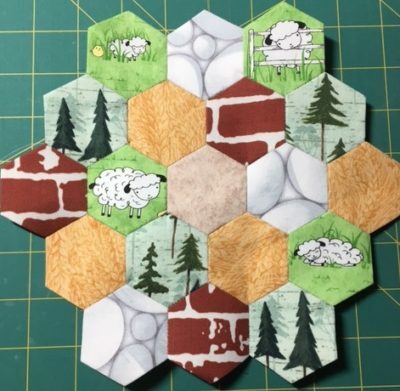 Love Bug Studios is back with another mystery quilt a long! This time focusing on Anne of Green Gables. The quilt itself has been meticulously designed and tested, and is available in two beautiful colorways: Sweet Anne and Fiery Anne. 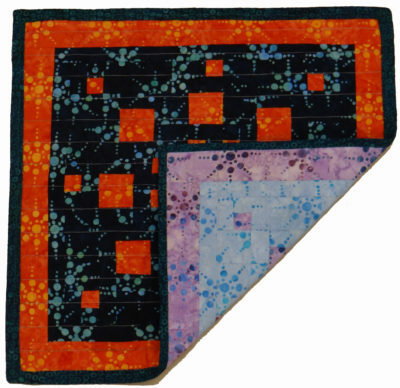 The mix of traditional piecing, dimensional elements, and unique blocks are sure to delight and challenge quilters of all skill levels and interests. Fiery Anne is based on the dynamic and bright Sunprint 2017 by Alison Glass for Andover Fabrics. We’re set to begin live classes on July 19th, 2017, but you can join us at any time and work at your own pace. 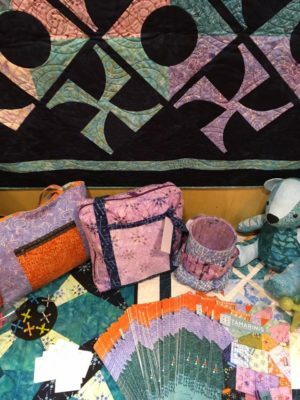 We have designed a quilt that will not only challenge experienced quilters, but will also provide newer quilters with the skills they need to be successful. If you are interested in participating, pick up your fabric now! 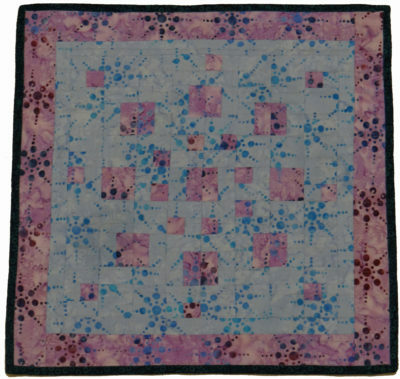 The LoveBug Studios Mystery Quilt a Longs sell out fast! If you participate, show us what you create! 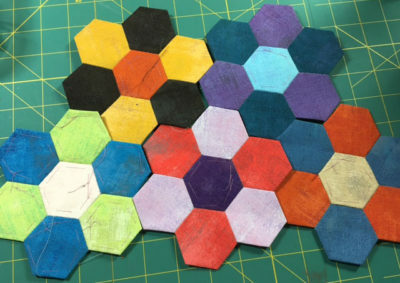 GenCon Classes go live on Sunday for sign ups! GenCon is the original longest running gaming convention in the world and it happens in Indianapolis August 17-20. They are unique by allowing you to pick and choose your classes and events ahead of time by securing tickets. No waiting in lines! Nicole, Toni, and Marc will be at GenCon again this year and Toni and Nicole will be teaching classes again! 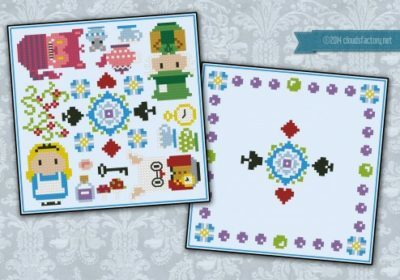 Toni will be teaching two English Paper Piecing classes. Nicole will be teaching Crochet classes again. Description: Learn the basic crochet techniques in scarf making along with custom techniques for making an almost seamless infinity scarf. Materials will be provided, but if you have different colors/hooks you’d prefer to use feel free to bring them. 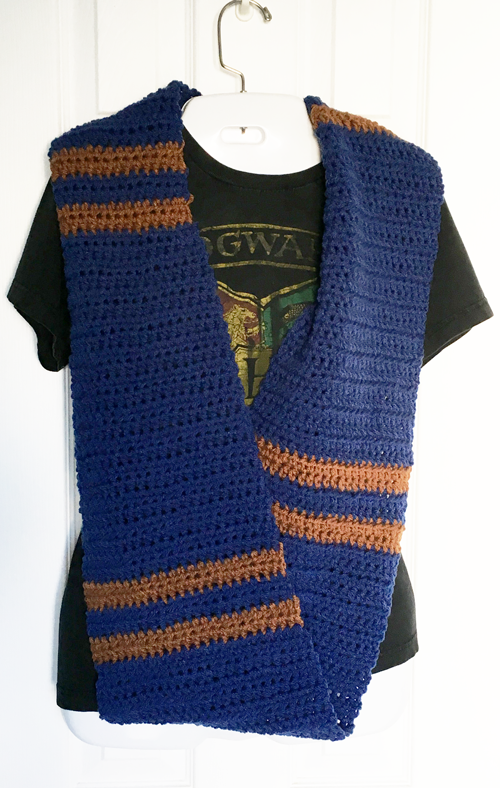 Novice and first time crocheters will most likely not finish during class hours, but tools will include a pattern to take home so that everyone can finish on their own time. So head over to GenCon and sign up for some classes! I don’t normally post “life hacks” types of crafts, but I’ve been looking into more of this stuff to suit my family allergy needs and I figure I shouldn’t just hoard it all to myself. 😉 So today I’m gonna give you the info you need in order to make your own laundry detergent and an anti-static wool ball. That’s it! Use maybe a ¼ cup per full load. You’ll likely adjust to suit your needs after a few experiment loads. If you prefer liquid soap, you’ll need to perform a few extra steps. First, take your grated soap and add it to a pot with 4 cups of hot water. Put it on the stove on medium-high, and stir until completely melted – about 10 minutes. Take that 5 gallon bucket and fill it half way with water, then pour in your liquid soap. 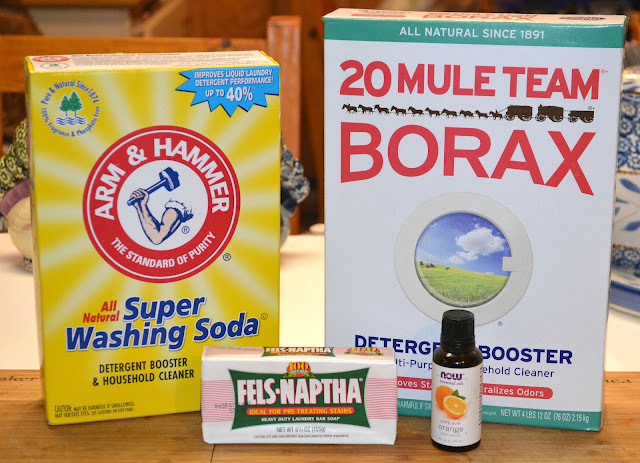 Stir in 1 cup of borax & 1 cup of washing soda into the bucket. If you want to make it scented, now is the time to add your essential oil. You’ll need ½ – 1 oz total depending on how strong you want the scent to be. Stir that in as well to combine. Now, fill up the bucket with warm water all the way to the top – and stir again. If you don’t have a utensil long enough to reach the bottom, just put on a pair of rubber dish gloves beforehand. SNap the lid on the bucket and let it sit for at least 24 hours so it can gel up. Once it’s done, you’ll likely notice it’s got clumps, or if you made it while it’s humid out it may still be pretty thin. This is normal/fine and you should still use it like normal. If you really want it to have that store bought consistency instead of being lumpy though, you can take an immersion blender to it to smooth everything out. Disperse it into other containers (empty detergent or milk gallons for example) and voila. You’re no longer beholden to the detergent industry. I know we’ve all heard the aluminum foil ball thing, but this one will leave your laundry smell nice instead. Make sure your ball of wool is tightly wound and wash it until it becomes felted. Then add a few drops of essential oil to the ball, letting it set before using. It will not need to be rewashed (bar anything happening to it), just add more essential oil again if the smell fades. Simply it toss it in when you are drying your clothes and bam. No more static. 🙂 If you really need that dryer sheet feel you can soak the wool ball in fabric softener instead, but the wool is key to help get rid of static. 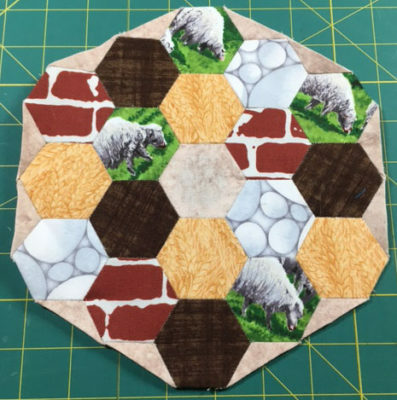 If you have been following my Twitch, Instagram, of Facebook, you may be aware that I have been making a secret quilt for Market for one of my new favorite designers, Tamarinis. It was finally revealed yesterday! 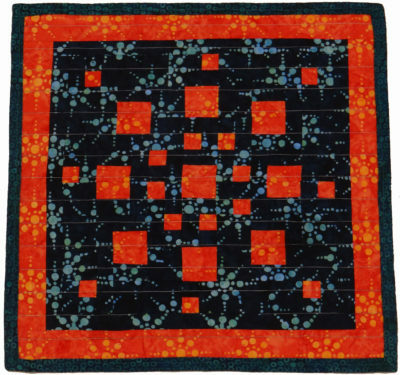 I am SOOOOOO excited to show you the quilt and this amazing line of fabric! The quilt I made is double sided! 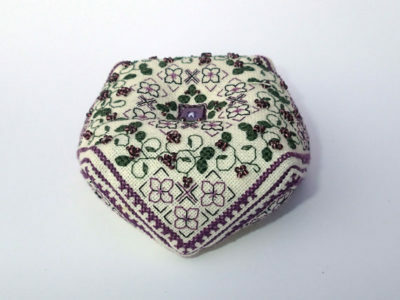 The exact same design is on each side using completely different fabrics. Tamirinis’ display is amazing here! You can find this amazing line of fabric in your local Quilt Store soon! Make sure you ask them to carry it! Want to spend some time with Tamarini in person? She is doing her own cruise!! 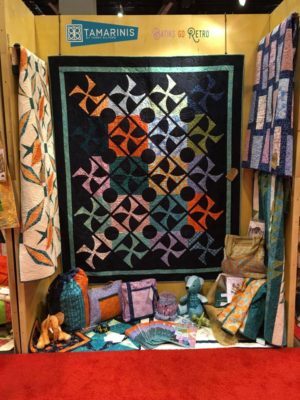 Today is the start of Spring Quilt Market! 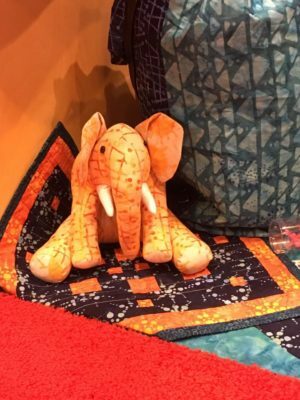 What is Quilt Market? 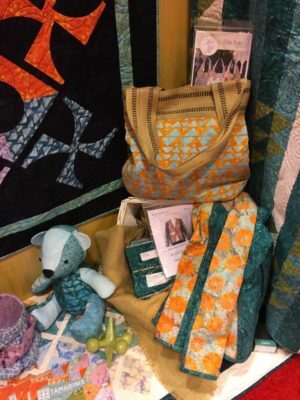 It is a credentialed quilt trade show. This means you need to be a quilt shop owner or industry professional (professional quilter, teacher, designer, or publisher). The fabric manufacturers, wholesalers, and companies that we want to see will all be there. This is the show where we get to see everything new coming out! I have seen a few previews and am SUPER excited about the new fabrics I will be able to get. I am also super excited to see new products from some of my favorite Companies, Arrow and Sew Steady. They have both agreed to give away products! I will be giving another chair away from Arrow! If you watch my Twitch live stream, you know how much I LOVE my Arrow sewing chair. It is comfortable the wheels are amazing. you really want one of these for yourself. Another super special giveaway will be from Sew Steady. We will be giving away their Ruler Work Kit. I will be holding the giveaways today and tomorrow as well as live streaming, sharing photos, and maybe an interview or two! Make sure you follow me on Facebook, Twitter, and Instagram to see all of the goodies. I won’t be picking winners until Monday so make sure you find the giveaway videos on my Facebook page, watch the video, and comment to win!